India is at a crossroads, and how its cities develop in the coming several years will shape its future for generations. While only about one-third of Indians currently live in cities, that number will nearly double from 420 million to 800 million by 2050. Whether those people live in safe, productive and clean communities will depend on how India’s leaders guide urban growth. A new report released today by the New Climate Economy called Better Cities, Better Growth: India’s Urban Opportunity finds that more compact cities experienced faster economic growth from 2002-2012 than cities that are more dispersed or “sprawled.” In fact, the report shows that smart urban growth can save India between $330 billion and $1.8 trillion (₹2-12 lakh crores) per year by mid-century – up to 6 percent of the country’s GDP – and create significant savings for households. India isn’t “sprawled” in the traditional way—Indian cities are among the densest in the world. But the problem is that it is not productive density. Instead of multi-level buildings organized into accessible neighborhoods, many Indian cities are filled with short, overcrowded buildings, and lack public transit and pedestrian spaces. So for each square mile of space, there’s a lot less room to live. One of the key reasons for this is India’s relatively restrictive land regulations like building height and zoning restrictions that prevent efficient, productive development. 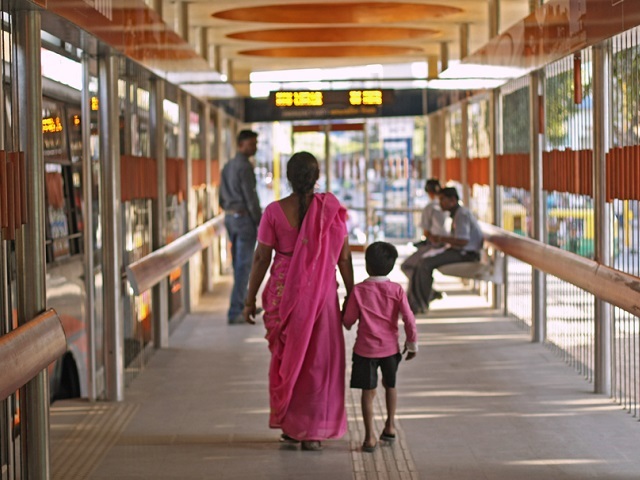 Smart urban growth in India therefore will require ensuring compact development without overcrowding and connecting people to places with a variety of transportation options, from bus rapid transit (BRT) to safe cycling. The cost of getting urbanization wrong is tremendous. Dispersed, low density cities with inadequate mobility options require a lot more money to sustain. When communities are spread out over large distances, infrastructure and services become significantly more expensive to provide, and many people are often forced to spend a lot of money and hours in transit. The New Climate Economy report notes that providing public infrastructure and services like water, sewerage and electricity is likely to be 10-30 percent higher in dispersed, automobile-oriented developments than in more compact, connected neighborhoods. Furthermore, traffic congestion, air pollution, traffic fatalities and poor health are all outcomes of poorly planned cities, creating additional costs both for residents and governments. Owning and operating a car in India costs 12 times as much as using public transport; 30 times more than using a bike. Delhi, India’s capital, is a stark example of how car-driven growth has led to traffic congestion that costs the economy an average of almost ₹5 (7¢) per kilometer for cars and ₹10 (15¢) per kilometer for buses during peak hours as a result of air pollution, wasted fuel and lost time. Considering the city already has more than 7 million cars—more than 300 cars per 1,000 people—the impact is significant. The recent air pollution crisis has brought global attention to how Delhi’s reliance on polluting vehicles has created a livability crisis that affects all residents. 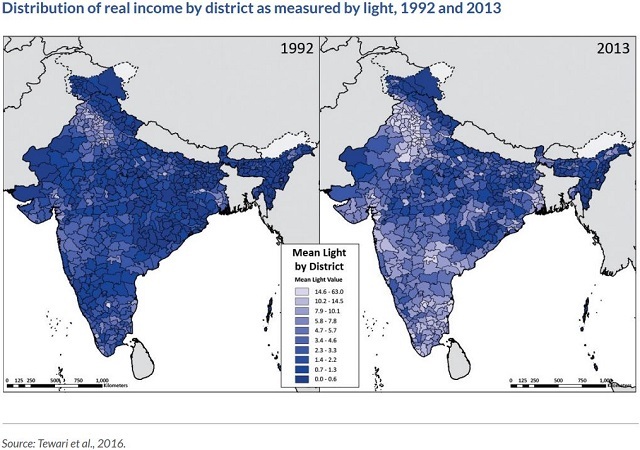 The new report uses satellite data of night-time lights to investigate the relationship between urban form and economic growth, and finds that cities had increased economic growth if development occurred within existing city limits rather than expanding beyond them. Graphic by New Climate Economy. Reforming land regulations can help India better manage its expanding urban footprint. Doing so will help make land use patterns more efficient and effective so that people can live in dense urban communities that work for them. The kinds of regulations in need of reform include restrictive maximum building heights and parking space requirements, but additional measures to the legal system will be essential, like determining property rights and conducting equitable public land acquisitions. Expanding sustainable urban infrastructure such as efficient, low-carbon public transport systems like bus rapid transit (BRT) is critical for ensuring that cities adequately meet the needs of their residents. Strengthening urban local governments, accountability and financing can be key to creating a system of governance that works for sustainable cities. Currently, it’s unclear how responsibilities for managing urban issues are divided between national, state or local governments, and technical capacity for city-led action is low, for example due to a lack of formal training for professionals in urban management. The national government should undertake reforms to clarify the evolving responsibilities of local governments, strengthen their administrative capacity and expand their fiscal resources. With 400 million new urban residents by 2050 and 75 percent of national income coming from cities by 2031, there is a lot at stake for India’s urban future. The country’s national and local leaders should recognize the urban opportunity and build on the momentum of newly created central programs like the Smart Cities Mission that aim to get urbanization right. Doing so will ensure that India’s urban future is one of inclusive and sustainable growth where all people can live in cities and have a high quality of life.